The 100 Season 3 picks up three months after the annihilation of the Mountain Men at Mount Weather. Over these months, there have been many changes, but Clarke and Bellamy's decision to exterminate an entire people hangs heavy over everything that's going on with the Skaikru, Trikru and other clans. Executive Producer Jason Rothenberg said, "They are all Grounders now technically." And, that's evident immediately in Season 3. The term "Grounders" is too general to be of much value as a describer going forward with the show's expanding world. It could be argued that the original "100" and Arkers who joined them form another clan outside the 12 Clan coalition. They are the Skaikru. The events at Mount Weather affect everyone who knows what happened emotionally, physically, romantically and/or politically. There's peace, but that doesn't mean it's all good. The peace is tenuous as Kane reminds Bellamy in the first teaser trailer. During the three months, the Skaikru established a true home base and have taken advantage of technology. 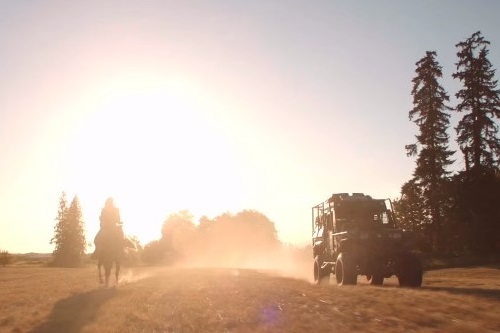 As the above image from the trailer shows, they have a vehicle now and horses too. This allows them to move around the lands more quickly and helps showcase the expansive world they must navigate. I've only watched "Wanheda: Part One and Part Two" and it's an impressive start to my favorite series on television. I wasn't sure how The 100 would possibly follow up the first two seasons, but Jason Rothenberg, the writers, directors, cast, and crew have exceeded my expectations. The 100 is fundamentally the same show as we saw last spring, but as there was a focal shift between Seasons 1 and 2, there's another one in Season 3. The intensity hasn't waned, instead the threats are even greater now. In addition to the story of the Skaikru and the Clans, separately Jaha's journey with ALIE continues and Murphy begins to uncover more about what happened years prior in the bunker. While you probably want to know more about what happens and specifics about certain characters, I'll leave that to the full trailer which comes out on Monday, December 14. Once that's released, I'll have a better feel for what I can and cannot say. One tidbit, I'll leave you with is that Trigedasleng is used for communication more often than in the past seasons. When and how it's used instead of English speaks volumes over the words being said at times. It's another example of the world expanding and the assimilation of the Skaikru. The 100 Season 3 doesn't hold anything back. It begins with a tortured soul and with the exception of the one truck scene I mentioned, that intensity doesn't let up. Mount Weather and what happened there provides an undercurrent to personal and political decisions being made, people's mental and physical state and really just about everything you will see on the screen. Check out the The 100 trailer and watch the season premiere Thursday, January 21 at 9 pm ET on the CW! You can find most of my The 100 interviews and other coverage at BuddyTV, including from a set visit this Fall. I'll also be hosting the "Inside the 100" aftershow each week and additional thoughts here at TV Diehard.